Product description: Veritas 019 is a Blonde American Sour aged on French Oak for over a year before being spiked with Raspberries. Pouring shockingly pink, Veritas 019 begins with sweet aromas of rich berries and notably peppery Brett. Intense, Vibrant Raspberry character leading to a refreshingly sour middle with notes of funk on the finish. 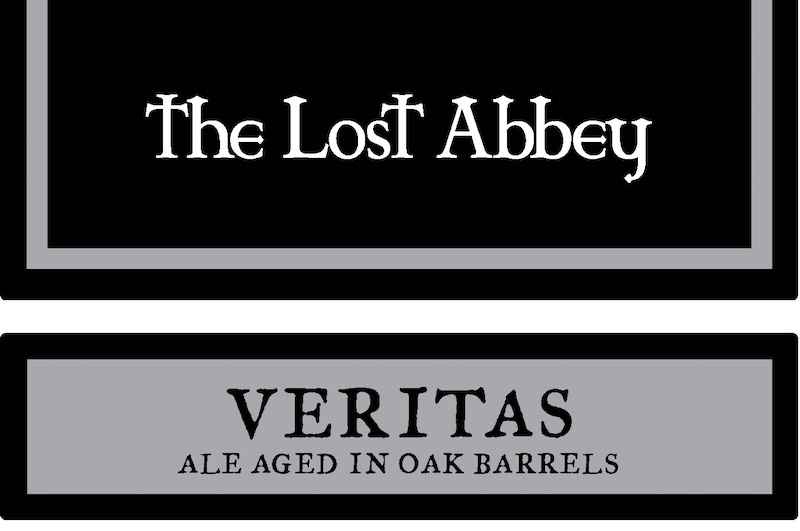 The Lost Abbey – The Lost Abbey Veritas 019 – 750 ml. bottle poured into specialty glassware. 5.8% abv. The Veritas series has been controversial for a long time. For this latest release, I think Port Brewing/The Lost Abbey did an outstanding job of fixing some mistakes of the past. For this release, you could “preview” the beer as a taster on-site at the brewery. Then, if you liked the beer, you could walk around to a booth and pre-order your bottles. After that, you just needed to show up on the specified date to pick them up without a hitch. Before opening the corked and caged 750mL bottle, I was previously told at the brewery to keep this a little cooler than 55 degrees and to open it while still quite cold to mitigate any bottle gushing (not an uncommon experience with this series). Popping off the cork slowly, this beer did gush, but not in any unmanageable way. That is, no one’s clothes got a nice soaking nor did the kitchen ceiling receive a new paint job. No beer was lost either. Pouring this quickly into the first available Teku stemware, this beer immediately pops out at you with its vibrant, bright rose color and baby pink foam. The head retention is outstanding for a sour beer and leaves nice lacing around the glass as you sit back and enjoy it. The nose is jammy and vinegary at the beginning cleaning up nicely to pithy cherry and raspberry flesh. It’s more dessert-like as it warms ending up at cranberry and cherry pie. In the flavor, there’s an excellent subtle oak balance that blends nicely with raspberry jam and cranberry juice acids. The barrel character and sour level aren’t overdone. Rather, it is fresh and zippy. It seems, to me at least, that Lost Abbey has had a difficult time toning down the acidity in their sour beers. With Veritas 019, this is really the first time drinking one of their sour series where I thought the acid level was well-restrained and readily approachable for any beer lover. Likewise, the palate has more finesse than I expected. It is somewhat salty, there is minimal acetic acid/vinegar prickliness on the tongue. Overall, the body feels buoyant and lighter with a quenching character. It’s not a sipper like most sours – far too refreshing for tiny samples. My only regret is that I should have purchased more bottles.